Wow, what a hot weekend. Over 100° in some places. And though we're in a drought as well, I've had to soak my veggie garden as it's drying right up. Not sure if I'll have much of a summer crop for my first go-round unfortunately. But, even though it's blazing, it IS September, and just the thought of that puts me in the mood for fall. So this weekend I finished assembling the top of my Halloween quilt. Now it's time to pick up the backing fabric and batting. Who knows? Might even have it done earlier than I predicted! Also, about a week or two ago, I finished a boatneck sweater from a free pattern I found on Craftsy.com. Yes, that pattern was made for babies/children, but I adapted it to my size and it worked out pretty well. At one point, we braved the heat outside and made our way up to the Hollywood Bowl for the 25th anniversary celebration of 'The Simpsons.' The orchestra played along with clips from the show, voice actors and celebrities did some live performances of our favorite songs, and the show ended with fireworks and the full Bowl cast performing 'The Bartman.' Totally worth the extra sweat. I got a few chores done as well, but the majority of the weekend was spent in front of the fan. I actually looked forward (somewhat) to coming in to work today - Air conditioning! 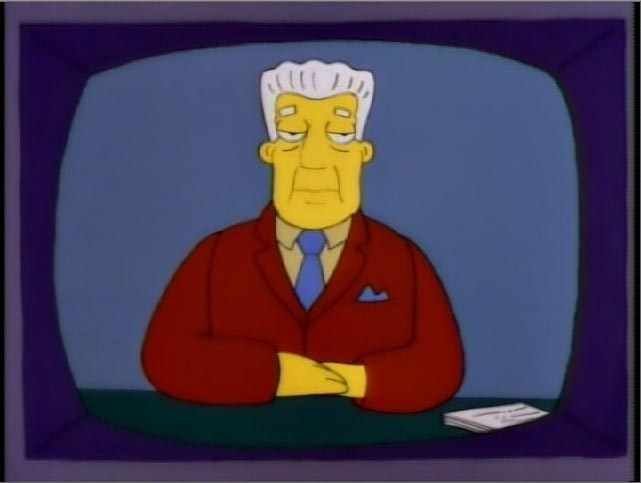 Kent Brockman: And so Springfield's heat wave continues, with today's temperature exceeding the record for this date, set way back four billion years ago, when the earth was just a ball of molten lava!